Thanks for your great articles on Dr. Haunold. I worked at OSU's Hop and Essential Oils lab and field station back in the late 60's and early 70's as a lab tech. I like to joke with my friends that I knew Cascade when it was a number. During that time I got to know Al and the others in the project (Sam Likens, Jack Horner and Gail Nickerson). You couldn't have a better supervisor than Al. He would often join us in the field to collect samples and on more than one occasion would pick up a hoe. I went on to be a high school world history teacher and would use Al's stories of growing up in Nazi occupied Austria as a young boy to help personalize the subject. 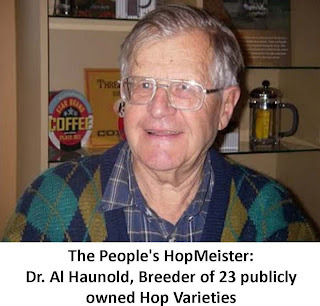 Thanks again for bringing Al to the attention of the brewing community.